We would cleanse and bring over the steamer which sends warm vapor to your face, neck and decollete. Then we would use a cleansing oil and an herbal toner based on your skin type. Would could exfoliate using an enzyme peel or a facial scrub. Then extractions would happen where we wiggle out what’s left in the pores if it is needed. The products do a lot of the work so squeezing debris from the pores may be limited at this point. Massaging the face, neck and decollete happens with essential oils, a serum and massage cream. A generous coating of a treatment mask follows. While the mask is on, we massage the hands and arms. 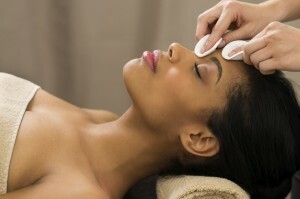 We finish the facial with the appropriate serum, moisturizer, lip and eye treatment and an SPF. It’s important to continue sealing and protecting your skin with hydration during the Winter season. It will keep your skin soft and moisturized and combat against dry, flaky skin and fine lines. Previous Previous post: How Are the Basalt Stones Used in Stone Massage Sanitized? Next Next post: Thinking About a Facial ?